I was recently invited by Nicky Hardcastle, lecturer in Visual Communication at UTS to share some thoughts about what I look for in a design portfolio. Thought I'd put it out there for the wider world web to benefit from. Incidentally, we will be looking to secure a new designer for our team in the early months of 2013. If you think you can see yourself as the next Boheemian, please go ahead and send me an email. 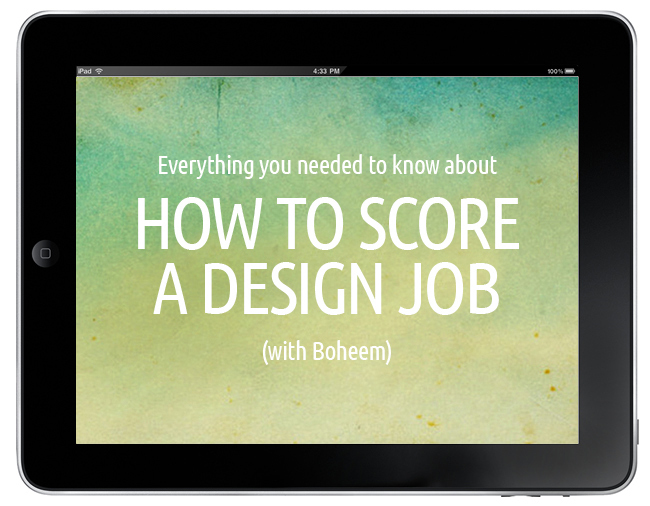 Obviously, these tips are from my perspective and relate to design positions at our studio… hopefully they are useful for anyone wanting to secure a job in the design industry, generally speaking! 1. Kill your babies. That is, know how to edit your portfolio in a way that shows your best 10 (or so) projects. Go for a succinct, punchy portfolio which really shows your strengths. 2. A spellcheck. And for goodness sake, learn how to spell stationery. 3. Set your PDF to 'open to fit screen'. 4. Flatter us. I can almost guarantee you'll get your foot in the door if you tell me you're a fan of Boheem's and that you know and love the work in our portfolio. Just sayin. 5. In your interview, think of 4-5 key things about yourself you want to communicate in the twenty minutes you're given. They might be: 'I did work experience here', 'I won this award', 'I completed a Wordpress course', 'I run a blog with 5000 followers'. Weave these points into the conversation, don't assume we've seen that stuff in your application. And then ensure to ask at least one or two questions about us. 6. Be flexible and generous. This one is a little controversial, so do with it what you will: if you offer to work for free for us for a few days so that we can get a feel for your strengths, if we are in need of support in the studio we are likely to consider getting you in (or having you work on something for a couple of hours at home). Once you're in, you're already a step or two ahead of the other candidates. Of course, we'd never officially suggest this, but if you show flexibility and preparedness to give some, we'll relax a little and give some back. 7. Keep your email short – 2 paragraphs is fine. 8. Ensure that the images in your portfolio are clear and crisp – lo-res, pixelated images aren't a good look. 1. Send anything over 5MB. 2. Send more than 2 PDFs (one portfolio, one CV/ letter). 3. Send any file type other than PDF – if you send me a Word Doc I will delete your email without hesitation. 5. Show print marks on your files, seems obvious but I have actually seen that a lot. 6. Ask about salary in the first interview. What do you look for in a designer’s portfolio? Neatness. A clean portfolio which is easy to read and displays projects in a way that makes it clear what they are about shows me that this designer knows how to effectively visually communicate. Personality. We're not accountants. Design, whilst at most times very hard work, is an exciting industry in which people dress in jeans and Tshirts, enjoy brainstorming campaign ideas in the sunshine over coffee and head out to local art openings of an evening. If you like baking on the weekend and are easily distracted by polka dots, throw this in. It's an insight to who you are. Intuition. We're keen to work with people who can think conceptually and come up with creative and smart ideas. A good match. You might be Australia's next big name in design, but unless I'm convinced that you're the right fit for the studio and for the type of work we do, I won't consider offering a position. We're a small studio and it's important we're all happy working together. If you're not successful in an interview it may have nothing to do with whether or not you were able to 'wow' us; it's got everything to do with us building a team of like-minded creative people. Some designers we meet with amazing portfolios are better suited at other studios with a different focus, we're ok with that and hope that our candidates can understand that too. What kind of projects should be included in, or excluded from, the portfolio? Include: A range of projects to show your skill set: some logo design and brand development, some newsletter layout, some digital / online work. Exclude: Let go of the pages upon pages of illustration, photography and retouching – that's not what's going to get you a design job. What would you say are the most common mistakes in portfolios and presentations? 2. Not adhering to the specifics in the request for applications in the advertisement (if there's been an ad). Read the ad carefully and if it says to use 'Mid Weight Designer' as the subject, do that. 4. Spelling and grammar mistakes. All the best to the jobseekers out there!